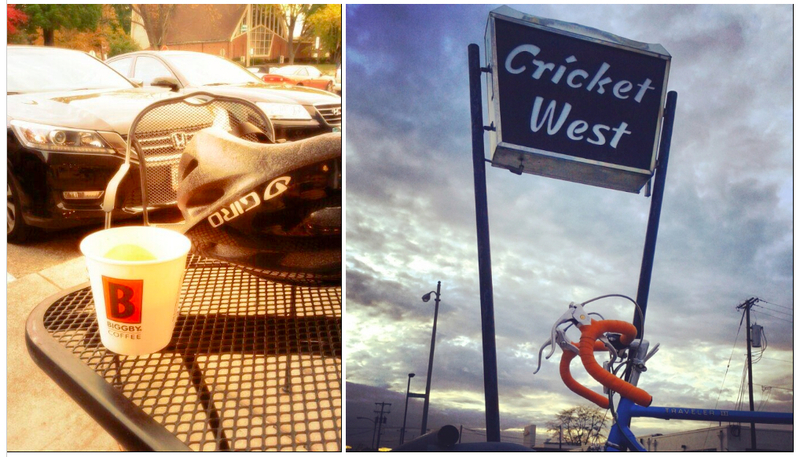 We head to Ohio today with a guest post from the first Ohio coffeeneur in three years of the Coffeeneuring Challenge. 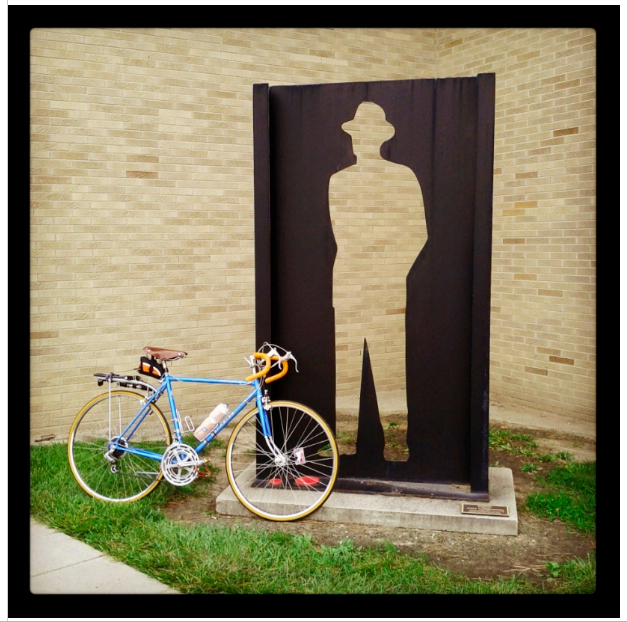 Jerel, who completed all of his rides on a vintage 1978 Schwinn Traveler III, gives us an inside look at his city of Toledo and bookends his coffeeneuring with two very sweet experiences. I’ll let you read about them for yourself, and hope you enjoy this recap as much as I did. 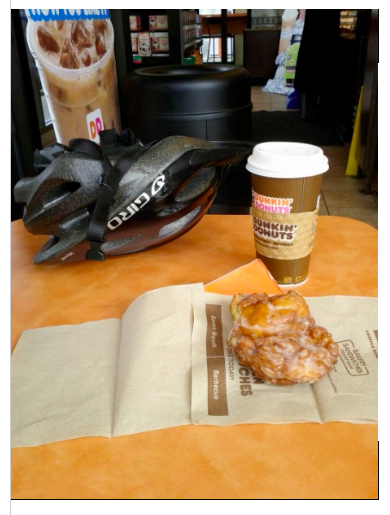 I went into the challenge with high hopes of using it to visit as many locally owned coffee shops a possible, but as I started scoping out routes I realized why I don’t routinely make stops at locally owned coffee shops while riding. There just aren’t many in reasonable proximity to my house. Even those not too far away would involve rides through parts of town where catching a stray bullet is a definite possibility, even in the middle of the day. Also, “opening day” of the challenge was shaping up to be a rainout. So, when I noticed around 2 p.m. that it had stopped, I checked the forecast and it looked like I had a good hour window for dry coffeeneuring. Here’s me, ready to head out, hoping I don’t get wet. I’m happier than I look, really. I hit up the nearest Starbucks for a double espresso. The man’s back you see in the photo is the Mayor of Toledo. 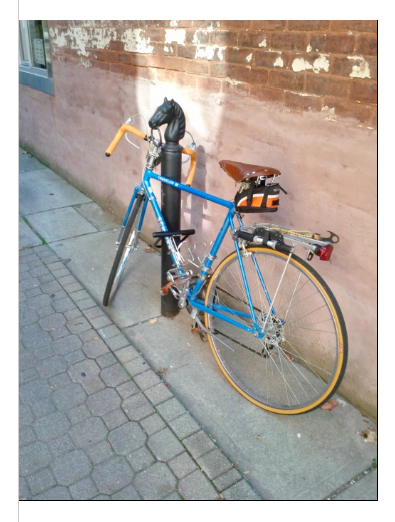 He complimented my ’78 Schwinn Traveler III as I was locking up and we chatted a bit about his also owing a vintage Schwinn (I’ve only ever seen him on a bike of the Harley variety). The sun actually put in an appearance while I enjoyed my drink and jotted some notes, but it clouded back up on the ride home and was raining again shortly after I’d tucked the bike back in the garage. In stark contrast to last week, this day’s weather was as perfect as could be. Unseasonably warm and sunny it was the day for a trek to a local shop in the next town to the west, Sylvania. To get there I utilized the University-Parks Trail (a 6-mile rail trail), cut through Wildwood Metropark (bad idea, paths way too crowded on such a nice day), Olander Park , through neighborhoods and into Downtown Sylvania. The Chandler Café is located on Main Street, a picturesque and tree-lined drag of restaurants, specialty shops, and the like. It was a nice spot, though I’m not sure why they’re serving Seattle’s Best instead of one of our local roasters’ coffee. They also have a food menu and beer, wine and liquor, but I stuck with coffee on this visit, snagged a nice spot on the sidewalk to sip my latte and on the way home looped through one more local park, Harroun Community Park on a MUP. I had a lot of yard work to attend to this crisp but sunny fall day. 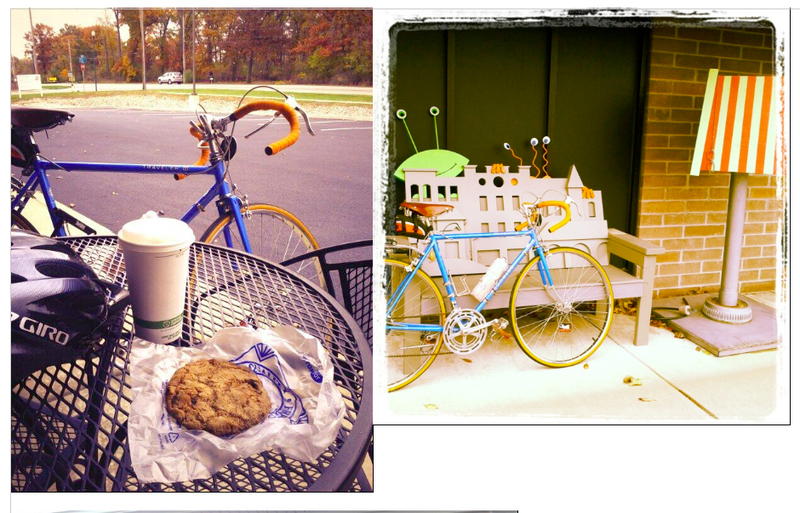 By coffeeneuring time there wasn’t a lot of day left so I again set my sights on a nearby shop. Just riding straight there and back would’ve been too boring, though, so I took a little loop through the campus of the University of Toledo, something I often like to do but I guess this was the first time since school started up since I had some trouble navigating through herds of Ugg and riding-boot clad co-eds. 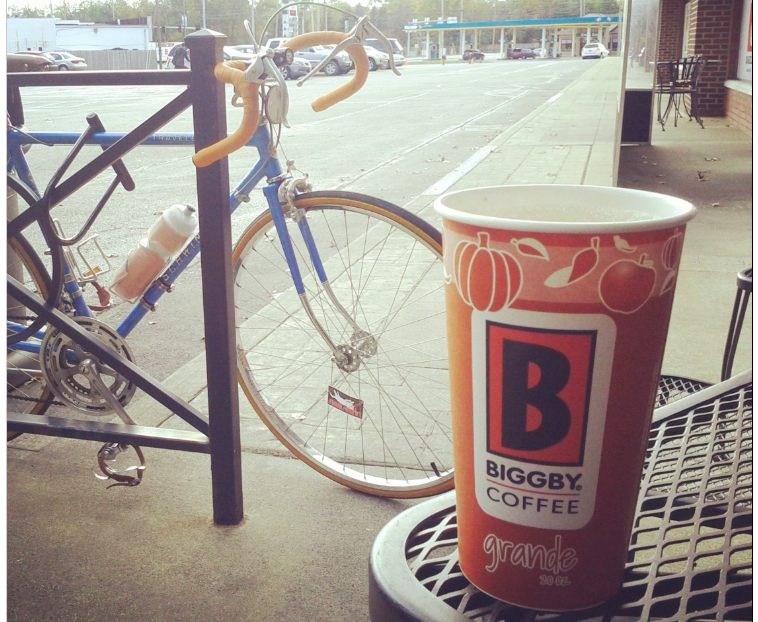 This Bigby location used to be one of my favorite locally owned coffee shops back in my younger days and it still holds some of the residual charm of the location. I thought a triple espresso sounded like a good idea but they gave me the fourth shot free and I couldn’t believe how much of a jolt it gave me. Good times. This ride was one of the highlights of the challenge for me. It was a brisk, 50-ish degree day, sunny, but still the kind of day that if not for the challenge, I’d probably have left the bike in the garage. 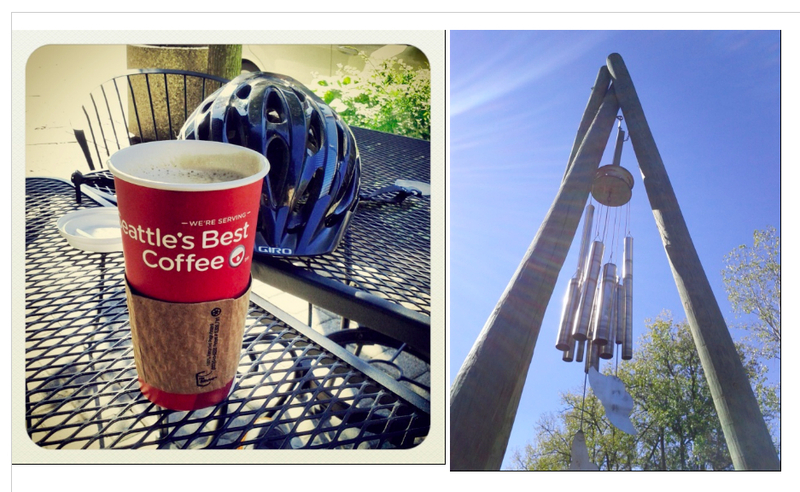 Rode west on the University Parks Trail, stopped at Barry Bagels for a cup of coffee. Barry’s is a great locally based small chain that makes great fresh bagels and sandwiches, etc. From there I knew I wanted to make a stop for some groceries (needed coffee beans) but I hadn’t planned how to get from Barry’s to the store. This turned out great, I ended up wandering through some parts of town I’d never been through before and the more I rode, the more I realized what a perfect fall day it was and how much better it was to be out riding around than, well, just about anything else I could have been doing. 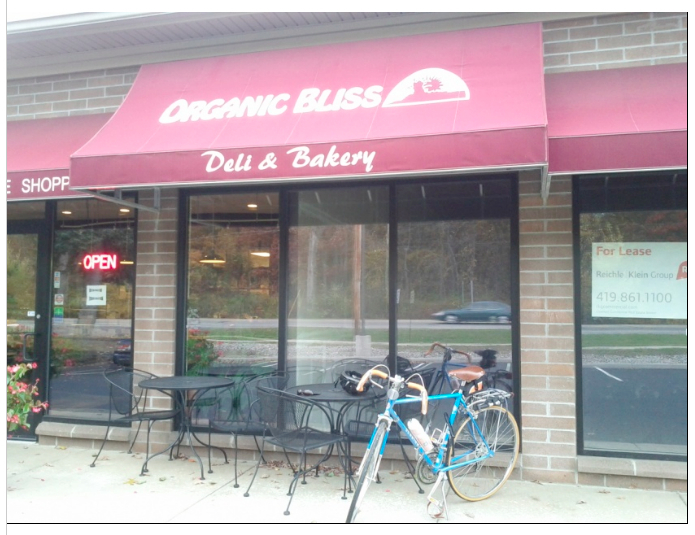 This day was forecast to be a rainout but when I saw the sun come out I jumped on the bike and headed for Organic Bliss. Aptly named, I’m not sure why it took me five weeks to think of this place. It’s located almost right at the western terminus of the University Parks Trail. Have you noticed how vital a role this trail plays to cycling in Toledo? At least my cycling in Toledo. Busy streets and very few bike lanes make it a go to for any point west of home. The coffee was a letdown as their website said they had an espresso bar but apparently that had gone by the wayside. The baked goods more than made up for it though. It was hard to choose from the healthy, delicious, delights on display but I’ve always had a soft spot for oatmeal raisin cookies. I had really planned on getting rides in on Saturday and Sunday this weekend to finish up early, but I’d had a nasty cold during the week that was hanging on through Saturday. Didn’t really wake up feeling great this day either and, to add insult, it was 8-10 degrees cooler than the day before, really the first full-fledged “blustery” day so far. But, I was determined to finish the challenge and, wouldn’t you know it, as usual, just getting out on the bike made me feel better. Yeah, it was chilly. Yeah, I’d normally have hung up my helmet for the year about a month ago, but that was a big part of why the challenge appealed to me, to keep on riding when normally I’d let myself make excuses. Last ride of the challenge and I headed out hungry. I was pretty sure I wanted to hit up this Barry’s location for a sandwich since I hadn’t eaten anything when I went to the other Barry’s a few weeks ago. This was a beautiful fall day for mid-November, incredible really. I headed out along a usual route but decided on a whim to check out a MUP through a city park that, for some reason, I’d never ridden. It was nice, a stretch through woods, leaves blanketing the trail, and no traffic to speak of. 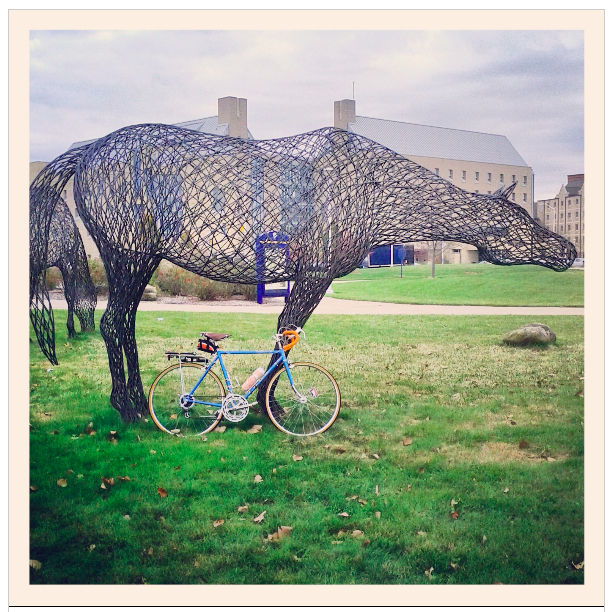 Ended up near University of Toledo campus where I explored a few new corners and took another Bike+Art shot. Took a short jog on the rail-trail then rolled through a quiet neighborhood taking lots of random turns along the way just for fun. Rolling the vintage Schwinn is such a conversation starter. It seems to spark nostalgia for everyone and they all either have or had one. 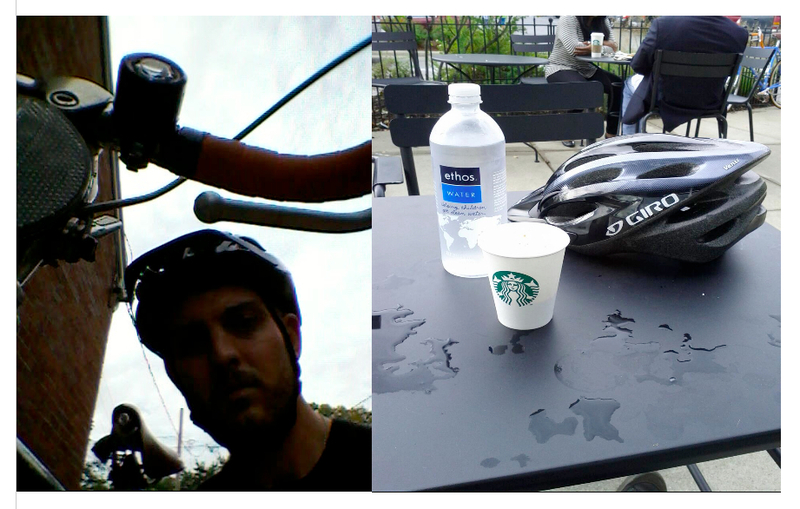 After grabbing an unofficial double shot from the Starbucks next door (which I’d previously visited on ride #1) I wheeled home, already thinking about how I’m going to make next year’s challenge even more fun.